Remember when suitcases didn't come with wheels or handy pull bars? 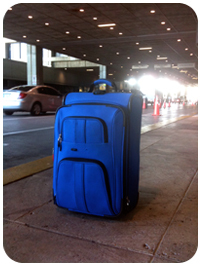 Yet now, just about anyone can carry, roll or drag just about anything with them on a trip. Hmmmm probably remote controlled luggage, driven by our cell phones - only another reason for these small technical wonders to be glued to our hands at all times. As a testament to the power and reach of a mobile device, this musing is brought to you from 36,000 ft, somewhere over Wyoming. Sky-blogging. It's not too big a leap to think I'll be driving my carry-on off this airbus some time in the very near future.